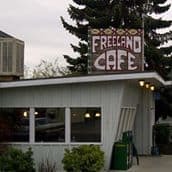 Family run from one generation to another, The Freeland Café & Lounge has been a Freeland, WA dining institution for 4o+ years. Featuring home style cooking with a variety of influences including tempura, Chinese, and traditional All American favorites, they serve comfort food at its best! You’ll find casual dining with friendly service, in a relaxed comfortable setting. This is where the locals hang out to eat and drink. Come in and watch the big games in our lounge, or bring your singing voice for fun and entertaining karaoke with some great local voices. If Southern Italian cuisine with a Northwest twist is what you’re craving, I think you’ll enjoy what you find at Charmers Bistro in Freeland. It’s a relaxed dining experience with full bar service, including an out-of- the ordinary selection of wines from Italy and other regions to compliment the entrees. I don’t know about you, but I’m not a fan of your typical, processed, massed produced Mexican food. Luckily, I found a spot that serves up truly unusual and awesome tacos, rice bowls, quesadillas, sides and snacks. It’s so good! Their motto is “Tacos are the answer. It doesn’t matter what the question was.” I’m convinced their tacos ARE the answer. Co-Owner Jill Rosen has over 1,400 cookbooks, and researched them to create recipes for her menu items you won’t find any place else. Not your ordinary taco shack, not by any stretch. Definitely worth checking out if you’ve got the urge for tasty Mexican food. Authentic Neapolitan and Sicilian pizza like none other, including vegetarian custom pizzas are the specialties at Village Pizzeria in Langley, WA. Gaze through expansive glass windows and enjoy spectacular, sweeping views of Saratoga Passage and the mountains beyond while dining in their newly remodeled and expanded space. When the weather permits, join them for casual outdoor dining. The search for a decent slice of pizza turned into a career for owner Paul Sarkis. When he moved to Whidbey Island, there was not an authentic hunk of pizza in sight. Paul created the decent slice of pizza he wanted, and it’s waiting for you! Direct from San Francisco, since 1994 it’s been the real thing! See them today for great food and drink in an extraordinary setting.